How to update multiple custom fields? 1. How to Manage Custom fields at a WORKSPACE level? The custom fields in Kanbanize allow you to add more properties to your cards, which are relevant to your projects, use-case, etc. Custom fields are made available on a board level, but you can also share them between workspaces. From the "Workspace and Boards Settings" panel (img.1) > select the top right tab named: Custom Fields. There you can find the predefined custom fields (p.1.1) in the system and/or you can create new ones (p.1.2). - Reporter (1): if you add this custom field to the board, every time when you create a card the system will automatically display on it, the user who created the card (card creator). - Created at (2): if you add this custom field to the board, every time when you create a new card the system will automatically display the time (date/hour) when it was created. - Last modified (3): if you add this custom field to the board, every time when you create a new card the system will automatically display the last time the card was modified(date/hour). Step 1: Click the dotted icon of the corresponding Predefined field and select the Assigned Boards icon to open the Board Lists panel. Step 2: Checkmark one or more boards from the Boards list to make the custom field available. To make the predefined custom fields mandatory for the cards -> open the Workspace and Board board settings panel (click on Manage Boards) -> go the other Custom fields control menu (1). You will find all predefined custom fields in the - Added in the board - section. Use the pencil icon that belongs to the filed you want to make mandatory. This activates the edit mode -> checkmark the Mandatory box. 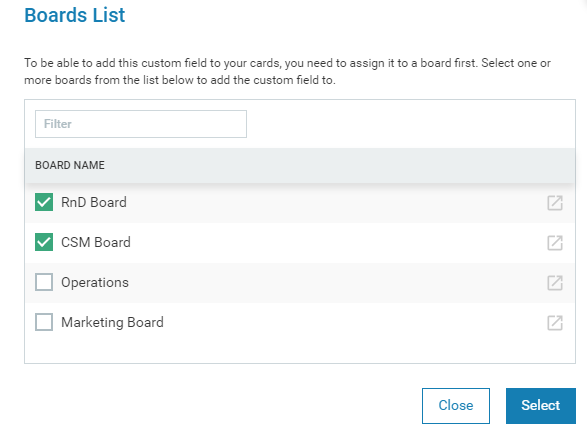 When a custom field is mandatory, every time when you create a card it will be displayed in the Cards Field sections under Custom Fields (img.2). Otherwise, you have to manually add it to the card via the Card Fields plus icon (1). To make the predefined custom fields visible at the closed card view (img.3), go to Card settings-> checkmark Custom fields. 1.2. How to create and add your own custom field? Step 1: Open the Custom Fields tab and click on the ADD NEW CUSTOM FIELD button (+) on the top of the Workspace and Boards Settings panel. Step 2: Enter the custom field name in the text box (e.g. Price) and choose the data type from the dropdown: Text, Date, Number, Contributor, Link, Dropdown. Input a default value (this is optional*) and click on the checkmark button to create the field (img.2). * If you enter a default value it will be constant input for that field. Step 3: To be able to add this custom field to your cards, you need to assign it to the board(s) first. Checkmark one or more boards from the Boards list panel. Note: The panel separates the own Custom fields from the Predefined fields. Mark SHARE BETWEEN WORKSPACE if you want to make the custom field reusable for other workspaces within the account. Use the Actions icon to enable the edit mode and checkmark the "Share" box. Note 1: If you want to use the field in other Workspaces, don't forget to add it to the Boards under the Workspace. Note 2: Use the ACTIONS button to: assign it to other boards, edit or delete the field. 2. How to Manage Custom Fields at a BOARD level? As mentioned in the introduction of the article, you can create and add a custom field to individual boards. The navigation is similar to the one described above. Click the settings icon of a board and select Board Settings to open the Workspace and Board Settings panel. Once you have set up your account and you have created the custom fields for your teams and projects, you will be able to add fields to your Boards either from the top Custom fields tab or from the Custom fields expandable section at the bottom of the panel (img.3). 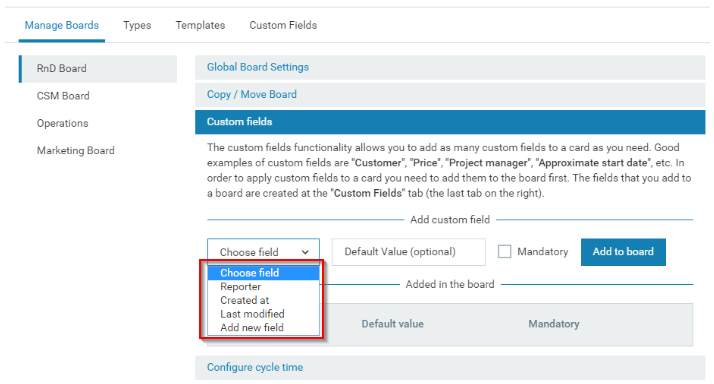 Open the supporting Custom field panel section (the third ribbon) and use the Choose field dropdown menu to select and add to the Board one of the predefined custom fields or any of the fields created/shared with the Wokrspace. Just select the fields -> set a default value (optional); make it mandatory (optional) and add it to the board via the "Add to Board" button. Note: Make sure that you have selected the Board where it will be made available from the left side of the panel. 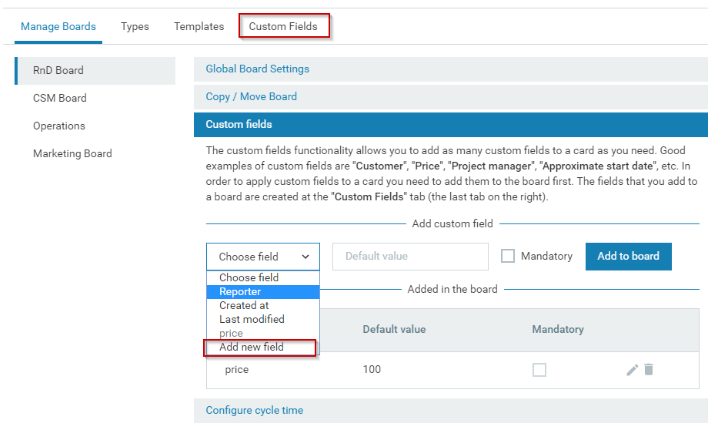 NOTE: The drop-down menu has the Add new field option that will navigate you to the main Custom fields tab -> ADD NEW CUSTOM FIELD (img.1) - repeat the steps described in p.1.1 if you want to create a new custom field. Important: When you add the selected custom fields to any of the Kanban boards, they appear as choices in the Custom field section of each task - click on Card Field (the plus icon) -> select the custom field and it will appear on the card. If the field is mandatory, it will be instantly displayed on the newly created card and no extra manual actions are required. You can add default values to your custom fields. In the case of а Dropdown type with a comma, you enumerate your drop-down list values. If you make changes in Custom Fields on the Wokrspace level, like adding a drop down values or changing the text of the default values, these changes will be synced to the board settings automatically, until you make changes in custom fields on boars level for the first time. Once you made changes in custom fields on the board level manually, the Global settings (on the workspace level) will never be synced again and you should make the changes manually on every board. 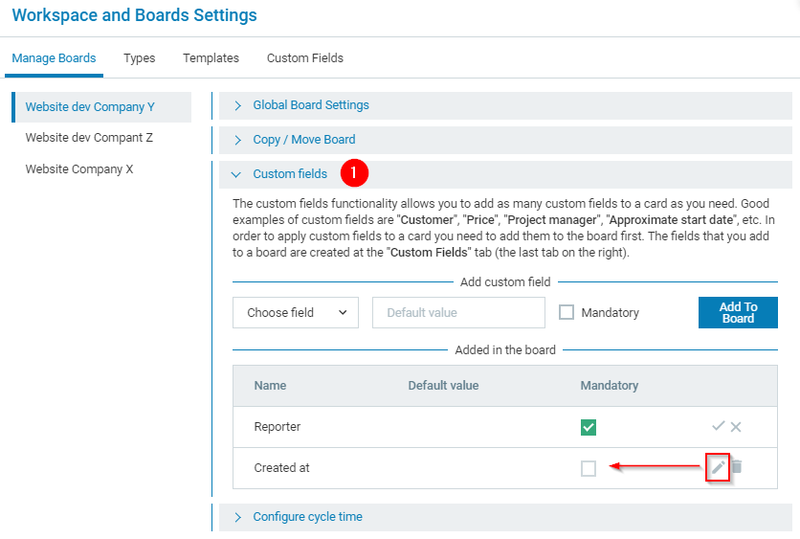 To learn how to Manage custom fields directly from the Board, please read the dedicated article. To learn how to use existing custom fields for multiple cards, please read the dedicated article.